PacQuest 3D is an entertaining and exciting arcade game for kids similar to Pacman, but implemented in 3D environment. 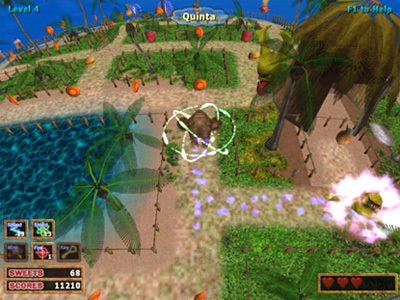 Quty the hero can use weapon to struggle against monsters and complete 16 planets to return home. Brand new version 3 features new weapons and spells, player can shoot monsters by magic Fire Balls, Power Shield and Trap Mines. Pass through 16 summer and winter levels in attractive faery arcade environment, arm yourself with formidable weapon, fight against dreadful Legocefals and terrible Eyekensteins, who want to stop you. You are put in journey by the magic of mighty wizard and have to pass mystical world of a number of planets. Complete dangerous world and return home!